If you have been charged with a misdemeanor or a felony, the charges could be reclassified to a more serious degree, with resulting heftier penalties, if it is determined that prejudice factored in the commission of the crime (775.085). Clearly, with so much on the line, securing aggressive, experienced criminal legal counsel is essential to a strong defense. A hate crime is one that is predicated on the hatred toward a victim based on characteristics of that individual. The crime may be directed toward the person, or toward that person’s property. Hate crimes were reported 124 times in the Sunshine State in 2016; this represents a nearly 22 percent increase over the previous year. Race/color was the number one motivation for these crimes, followed by sexual orientation and religion. The majority of these crimes—nearly 70 percent, were crimes against persons, with crimes such as intimidation, robbery, and assault. Crimes against property were reported in about 30 percent of cases, primarily in the form of vandalism, burglary, and arson. The federal government has a stake in hate crimes too, and is committed to securing indictments and convictions for hate crime prosecutions throughout the nation. The national statistics have been spiking at alarming rates, with crimes against those of Arab descent doubling, and anti-Semitic incidents climbing by nearly 40 percent. Acts against Muslims have been steadily climbing for a decade. Federal support to local agencies provides state and local law enforcement with necessary training and resources to clamp down on accused offenders. Whether or not law enforcement officials were trained to document and build a case in a hate crime scenario. 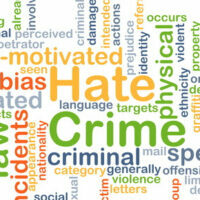 Are You Facing Hate Crime Charges? No one relishes the thought of fines or prison time. If you have been accused of a crime that was motivated by hatred or prejudice, chances are you are looking at substantially more time behind bars than you would be facing without the enhanced penalties. Now, more than ever, you need a tough lawyer who will go to bat for you. At the Salazar & Kelly Law Group, P.A., we leave no stone unturned as we craft a defense that will produce the best possible results for our clients. Contact us in Kissimmee for a free, confidential consultation today.